Although I’ve mentioned it in a few weekly roundups, I haven’t written a post yet about wedding dresses. That’s because I have never been all that excited about wedding dresses, and my efforts to find pictures of dresses that I find at least somewhat appealing have failed me. Seriously. I go through an entire issue of The Knot without folding down a single page. Something that I can wear with as normal of a bra as possible(i.e, no strapless, no backless, no halter). Something with movement. I had searched for “grecian goddess” type dresses extensively. Something with sleeves, but does not look boring or conservative. This preference could be negotiable. That’s about it. I’m pretty open on the options of fabric. I don’t know whether I’ll love or hate any of the usual suspects, like lace, tulle, satin, chiffon (wait, isn’t that a food? ), etc. So, here’s my main wedding dress dilemma. I’m chesty. And I can’t wear anything strapless because I have never, ever, found a strapless bra to be supportive enough (in my lifetime, I have probably tried on about 25 strapless bras). I chuckle at those strapless dresses or shirts you can buy with “built in bras.” When I try those on it’s like a joke. The weight of The Girls just completely overwhelms any sort of built-in bra. And okay, so maybe wedding dresses are different. Maybe they’ll build in some amazing miracle strapless bra that can hold up The Girls. Two issues remain. 1) Spillover, and 2) Always feeling like I want to hike up my dress, even if it does fit me well and shouldn’t slide down. You all know what I mean by spillover, right? Not a look I really want to go for on my wedding day (see picture below). Here are some of the dresses I have bookmarked over the last several months. These are in no particular order of preference and do not take into account the minimal amount of money I’m willing to spend on a dress. In fact, some of them are pricey designer dresses. But these are just a smattering of dresses, from a design perspective, that have caught my eye over the last several months. 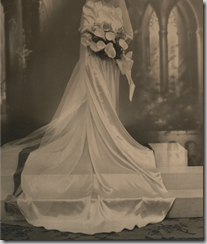 Then I started to consider having my grandmother’s impeccably-preserved wedding dress (pictured below) re-designed into something that I wanted. That way I could get exactly what I want – sleeves, but not too conservative. But, I had a few major concerns about this idea. More recently, I realized just how much I started to despise anything even remotely “bridal” looking. I think I had come to the conclusion that all wedding dresses looked so much the same and it agitated me to no end. Strapless, shades-of-white, overpriced articles of clothing that I didn’t even like. Gah! 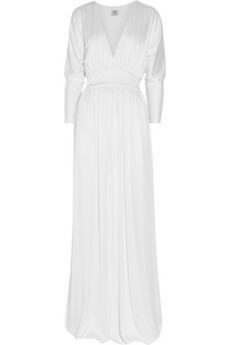 So, I started looking for just white party dresses. To give you an idea of what I found, here are some things I bookmarked (some of them aren’t necessarily white, but I just like the style). And then, The Perfect Dress? Okay, it doesn’t have sleeves, but at least it is not strapless, and the straps are thick so they balance out my top-heaviness. I think it also fits well into our outdoor, woodsy, picnic-table autumn wedding that we’re having. As an added bonus, it’s not overly bridal-looking. And then, a few days later, I came across a blog post about a photoshoot of a “Tangled” inspired wedding. I think that the hairstyle pictured below would look lovely with that Saja dress! (wooo for my long hair and bangs!). And, these blue shoes? Awesome! For once, I finally feel like my wedding dress stuff may be coming together. But, a few concerns remain. Although it will not be a deciding factor, I worry about how my family would feel about a shorter wedding dress. Another person, after showing them a picture of the dress, pointed out to me that I should want to “stand out” on my wedding day. But, does “standing out” mean that I have to wear something that I don’t like? I plan on wedding dress shopping alone. I do not shop well with others and find that people get offended if you do not agree with their opinions. So, I’d rather just not deal with that. Maybe once I narrow it down, I’ll invite some folks, including my mom. But I think I’d rather just have it be a surprise! Now, I just have to see if the wedding dress looks as nice on me as it does in the photo. 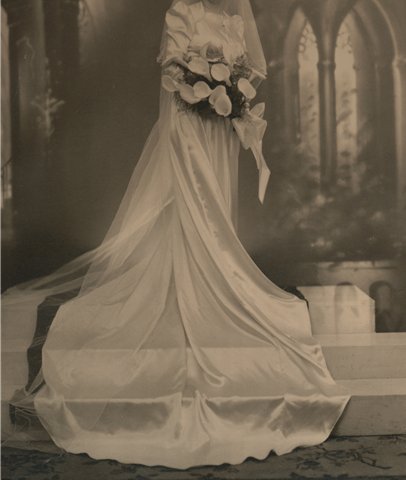 Did it take anyone else a really long time to find a wedding dress they liked?